Thanks to Thanks to Radar/Junoman for dumping and releasing this! 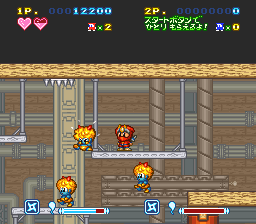 Maru's Quest was going to be a localization of Super Ninja-Kun. 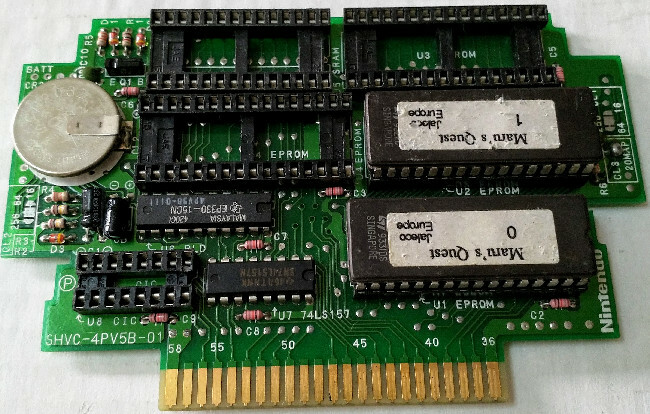 The prototype originates from a lot of games salvaged from Virgin Games' offices when it shut down. The prototype indicates they (presumably Jaleco) were considering releasing this game in Europe. I have not found any evidence that a North American release was planned. 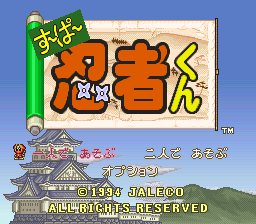 A Game Boy game from the series, called Maru's Mission was released in North America. The game is very cute, showing Maru hopping and fighting enemies from Japanese mythology. The controls are not perfect, but it is a competent platforming game. The prototype is clearly not just a partially localized version of the final Japanese release. 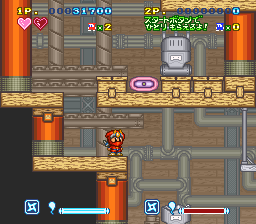 The in-game text is still in Japanese, only the title screen is localized. 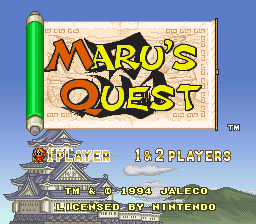 The title screen in the prototype, aside from having the English title "Maru's Quest", also lacks and options menu, has different fonts, and says "Licensed by Nintendo". The background of the scroll in the prototype has the Kanji "忍", which means patience or endurance (it is also the first character in the word ninja 忍者). Prototype title screen "Maru's Quest" Final "すーぱー忍者くん"
The top option says "おんがく　メイン" (main music), while the bottom says "こうかおん メイン" (main sound effects). These options allow you to choose from two different soundtracks, the main one being fleshed out, while the second is more sparse. In the prototype, it actually uses the main soundtrack, but it is much sparser. The music must have been one of the last things they finalized in the game. 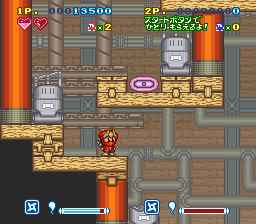 There are some changes to the level layout in the second stage. These changes result in the game being somewhat easier in the final version. There are also several places where I encountered glitches in the prototype. 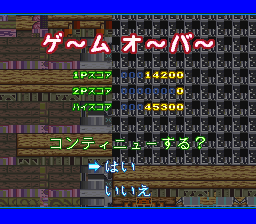 For instance, when I had a game-over at the second boss. 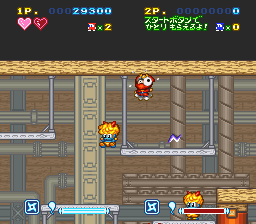 I also saw glitches at the end of the first stage where Ninja-Kun jumped on the anchor.